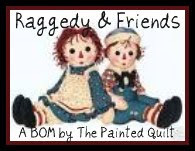 The Painted Quilt: Coming Soon…Raggedy & Friends BOM! Coming Soon…Raggedy & Friends BOM! At the outset, please let me thank you all for the positive feedback that you sent my way when I first showed you the photos of Raggedy & Friends, my first full-sized quilt design back in February of this year. It is for that reason, as well as the overwhelming number of requests, that I’ve decided to offer Raggedy & Friends as a free, 10 month Block-of-the-Month. Starting on the 20th of July and on or about the 20th day of every month until April 2011, I will be releasing a new block or blocks in a PDF format which will include a color close up photo, line drawings and general as well as piecing instructions. The first month will also include the fabric and notions requirements. Having said that, this quilt is very fat quarter friendly and the scrappier the better. Raggedy & Friends is comprised of 12 individual blocks. Nine of the 12 blocks include two stitcheries each and three of the 12 blocks have one stitchery in each. In the seventh month, I will release blocks 7, 8 and 9 together as they are the ones that have only one stitched design in each. The tenth and final month will include the last block and finishing instructions. So please grab my button below and place it on your sidebar and link back here in order that we can share it with those who might not otherwise find their way here. The button will also act as a reminder that on the 20th day of each month for the next 10 months I will be posting a new block to share with you all. So are you up for it? Will you be joining me? I promise you’ll be in for a good time! Right click in the image. A menu will pop up. Click on "save as". This will automatically store the image in your photo or picture file. Click on "dashboard" at the top of your blog. On the drop down menu, click on "Picture". Further down where it says "browse", click on computer. That will automatically take you to your saved photos. Scroll til you find the Raggedy & Friends button, click on it and it will appear in the box. Go down to the bottom of the screen and remember to click "SAVE". That should do it. I admire all the stitcheries here...absolutely love Raggedy Annies and Andies soooo maybe I'll work on this as well! I'm interested in this project! Awesome! Of course I'm in and can't wait to get started! You are so very generous with your talents. Thanks again. I am so excited. I have started sewing again after about ten years because I am having a new grand daughter. Her mother has been collecting Raggedy Anns for years and plans to decorate the baby's room with them. She will be ready for a big girl bed by the time she has her own room. Thank you so much for offering this opportunity for me to embroider and sew a treasured piece for her. OHHHH Boy!!!! This means I need to straighten up the sewing room and pack away some more UFO's for a later time, cause I'm going to do this FIRST!! Now I'm off to see if I can remember how to put buttons on my blog. Thanks so very much!! That is absolutely wonderful. I adore raggedy Annies and Andies. How generous of you to offer it as a free bom. Definitely will be along for the ride! you are such a generous soul to share your wonderful talent with people all over the world kaaren! 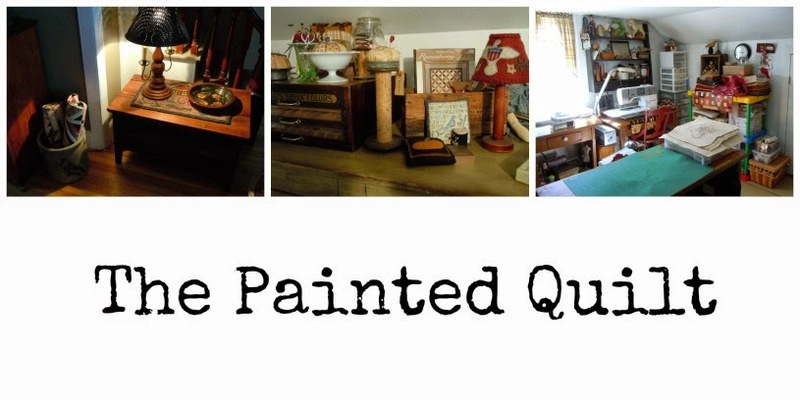 i'm sure we are going to see raggedy quilts popping up all over blogland in a few months time. well done and huge hugs to you my dear friend! I would love to join your block of the month but am not quite sure how to put your button on my blog page. Oh!! I'm Happy Dancing herein SC. I just love that quilt!! Wow - this is gorgeous!!! Sign me up!!! I am so very excited!!! I am doing the Stitching Annie project right now and have really enjoyed the detail on your design. I'm just about finished with it. I am going to use red heart buttons in the corners and red/white checked binding around the edges.It is turning out beautiful! I can hardly wait to start the quilt!! 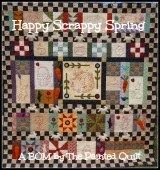 I love stitchery quilts, will definately follow along! Wow! That is so generous of you. I LOVE your quilt and will for sure be joining in. Thank you Kaaren. This is going to be so much fun!! Holy Moly Kiddo, you are the best!!!! Wahoooooo - I'll definitely be joining you. I'm beyond excited, Kaaren. WooHoooooo!!!! Oh, Kaaren I am so excited. Thank you for sharing your talent! I'll be putting it on my blog tomorrow. Can't wait to get started! There's something about the Raggedy Ann and Andy that always draws me in. I have my mom's Raggedy Ann and would love to make this quilt!!! I can't wait. Thank you so, so much for being so generous! Oh how adorable! I love it! YAY!! I can't wait for your lovely Raggedy Ann and Andy!! What an extremely generous project! Wonderful fun. Wonderful, Kaaren, I just added the button on my blog.I am ready. I have not done anything like this before but it looks interesting, Thanks for doing this. Karen, that quilt looks awesome...I so want to do one but I will be moving in a few months and will be homeless for a few also..... It is just lovely! This will be a wildly popular BOM, Kaaren. I'll be following along as I'm not a stitcher. You're not only talented but so generous. I am really excited about this! You are soooooo talented and generous to share both the First Friday patterns and now Raggedy...thank you sooooooo much!I will be looking forward to each 20th of the month! Kaaren, I just left a comment and as I clicked off your blog, I saw it come back up so think I got the word verification wrong. If it shows up twice, though, know that I think the BOM is a fantastic idea! You are so generous. I am verrrry tempted! :) I can't wait to see what everybody does! Thank you so very much, Kaaren. I loved doing your sewing Raggedy.I have fabric leftover from when I made the dolls as gifts and can't wait to include it in your pattern.Thank you for being so generous. Have a great weekend. I like your quilt. This is one that I am interested in. I have added your button on my blog. Thanks for sharing your design with BLOG LAND. You so darned giving Kaaren. It will be fun seeing these quilts pop up all over blogland in the months to come!! Obviously already a big hit, Kaaren! Your buttons on my blog. Thank you as always for your kindness. I love BOM's and FREE, of course I'll be joining in..Thanks! Oh, thank you, thank you, thank you....now I have to get some things finished so I can start stitching on the 20th. What a lovely BOM, many thanks !!! how exciting and how generous! Kaaren I love it and will be joining in with you. I'll try to put the button on my blog but haven't had much success in times past. I have Ann and Andy keeping me busy sometimes with their tricks, so I think I need to join this lovely BOM to keep them quiet and watch me embroider all those blocks. Thank you! I remember when you first showed your finished quilt and I've been secretly hoping for a pattern-- And a on-line BOM is wonderful. thank you, thank you! Por supuesto que estoy y no puedo esperar para empezar! You are so very generous with your talents. Eres tan generosa con su talento. Thanks again. Gracias de nuevo. Oh my gosh - I can't believe this is a free stitchery- thank you so very much. I will so look forward to joining in the fun. Exiting - I love "Filledokke Anne" and this quilt. Thank you for the boom - Your button comming up on my blog soon. Hola Kaaren, precioso este quilt, estaré pendiente cada 20, gracias por compartir, desde ahora te sigo y me llevo el logo a mi blog. Thanks Kaaren, I love your quilt and have posted a button on my sidebar. Oh, put me down!! I'll have to get my dear hubby to help me post the button. I am one of those that have been very interested in your Ragged Annie quilt. What fun it will be to do it throughout the year. You are so generous to do this for us. The word verification this time is "easyness". I like it when it is a "sort of" real word. You betcha Kaaren....I'm looking forward to it! Off to post the button on my blog now! Love Raggedy Annies and Andy's so I'm in for this gorgeous BOM.I have the button and will post it on my blog over the weekend.I can't wait for this BOM to start.THANK YOU :) Barb. Thank you for sharing. I remember seeing this quilt on your blog before. Will be putting a link on my blog. Happy days. Hi Kaaren!! I just love your project...may I do it too? I may not keep up...but then, I just might! Thank you dear Kaaren, I can already see that this is wildly popular...good for you! That sounds like a fun challenge. I might try it in a smaller version, so hope that is ok. Now I need to figure out how to do buttons, so I can link to you. Wow it looks great! I'll put your button on my blog, not sure if I can fit in another project but I'll see how I go! You are going to give this one for free!!!!!???? I promised myself to start nothing new this year, but I will download it and store in my want to do list. I love this BOM, I am very happy you put it up for free, thanks very much for that, I have als put your button on my blog. That is so cute, you did a great job designing that quilt. I look forward to watching everyone stitching those cute blocks. Thanks for such wonderful blocks. Thank you so much for sharing thia wonderful free BOM Karren. Looking forward to participating. Yippy! I'm so excited about this new BOM. I'll be doing this one for sure. And better yet it starts on my birthday. Thanks for the great gift! This is an absolutely adorable quilt! Thanks so much for this BOM-I'm definitely in! Thanks too for the button info. You are so talented and generous Kaaren! Thank you! I hope I can organize and create this masterpiece. Oh hon what a lovely, generous gift - thank you so much for sharing this darling quilt! I'll put the button on my sidebar tonight! So sweet and generous of you to share, thanks so much. I would love to join you, doing this quilt. Look forward to July 20th. I don't have a blog but will check in each month. Kaaren!!!! Ohhh Thanks!!! I love that quilt!!! Your button is in my sidebar wiht the link!!! I did it. Thanks for your very good directions. I now have your button on my blog. Can't wait to see the patterns. I am a long time lover of Raggedy Ann! Hola, me encantaria poder participar en este Bom, aumque me he prometido no hacer ninguno mas, pero este es tan bonito que no he podido resistirme. Muchas gracias por compartirlo con nosotras. Un saludo y buena costura. I am charmed with the offer. Thank you for sharing this project Kareen. Yo me apunto encantada. ¡¡Muchas gracias por compatirlo!!. Hello I am of patagonia also gustaria Argentina and to participate to me! Thanks to share it! Thank you much for sharing your talent and beautiful designs with us... I'm in...the quilt is gorgeous!! Hola Kaaren, me gustaria participar en este proyecto. Es muy bonito, y gracias por compartirlo con nosotros. Hola me gustaria mucho participar, gracias Kerem. Hola gracias Karem, es precioso. me gustaria mucho participar. Of course, i should like to participate in your BOM. I will put the logo in my blog! sory but my english is very bad! I love this BOM, of course I'll be joining in..Thanks! Kaaren, I am with everyone else ... I think this would make a great bom project and that you are a generous person to put it out there for us for free!!! I hope to follow along. Hi I'm ready, I'm going to put the button in my sidebar. I can't wait to the 20 of july. Wow!!! thank you for your generosity. Your designs are very beautiful!!! Of course, I sign in it, I'll try to work on time!!!! Your button and link are on my blog already. Hugs from Spain (I've seen we're a few yet). Hello, I love the project I will try to carry it out. I already linked to my blog, for updates. This is awesome! !I`m ready and excited! Thanks you so much for sharing it with us. I love this quilt... Thanks so much for your generousity in sharing this project with us! What a gorgeous quilt and I would love to join in on the fun! Will link back to your blog from my sidebar. Thank you again for being so generous with your fabulous stitcheries! Beautiful, thanks for your generosity, and I want to do my best. The Raggedy Ann and Andy's are some of my favorite childhood characters. Thank you so much for your generosity! I've added your button to my sidebar. Hola, acabo de conocer tu propuesta y me gustaría apuntarme si todavía estoy a tiempo. 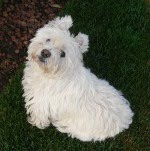 Hello, I have just known your offer and I would like to sign if still I am in time. ¡Hola! ´ojalá este a tiempo. Me gustaria participar en la elaboración de este edredón, está precioso y gracias por compartir. Karen,Hi! my name is Andrea and I am from Argentina.I want to know if it is too late appoint myself to do that wonderful projet,Pease!! !Thank You! What beautiful craft you create! All your OPAM finished too: most impressive. Your FFF offerings are so lovely!! je serai heureuse de participer à ce nouveau bom, je le trouve si beau, bravo pour ton talent, j'adore ton blog, encore un grand merci pour ce partage !! I absolutely LOVE Raggedy Annie!! I'm not sure how to participate with this BOM, but I would LOVE to! I just found this Raggedy and Friends quilt of the month, I know it is over, but my step mom loves Raggedy Ann and I was wondering if you have archived the patterns somewhere so that I could access them?